Acupuncture and Oriental Medicine Day is observed on October 24 to bring awareness to acupuncture and Eastern medicine. Acupuncture has become increasingly popular with one in ten adults having received acupuncture at least once, according to a survey done by the National Certification Commission for Acupuncture and Oriental Medicine. 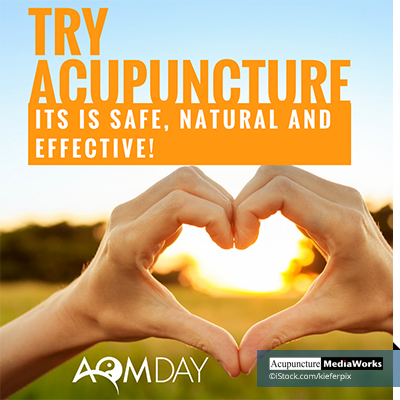 The official commemoration for AOM Day began in 2002 and has been promoted by many organizations in the U.S. including the Council of Colleges of Acupuncture and Oriental Medicine. AOM Day is also recognized in other countries such as Canada, Mexico and Pakistan. Annually on October 24, Council member colleges come together through activities to promote awareness and the benefits of acupuncture and oriental medicine. Free acupuncture treatments at college clinics are typically offered on this day as well as free talks, health fairs and more. The Council includes 49 accredited AOM colleges across the United States and welcomes other organizations to join in efforts as well. All Oriental medicine including acupuncture is based on the idea of the flow of Qi throughout the body. Traditional Chinese Medicine believes that when we are ill, there could be a blockage or stagnation in our body’s natural energy flow, which affects the organ systems. Acupuncture is used to correct this imbalance through the specific placement of needles on the body. complementary treatments combined with conventional methods. The National Institutes of Health Consensus has stated that promising results have emerged, specifically for postoperative and chemotherapy nausea, vomiting, as well at postoperative dental pain, low back pain,carpal tunnel syndrome and more. There are now around 40,000 acupuncturists and close to a hundred acupuncture schools in the U.S. Numerous studies have since been done about acupuncture and its healing effects as more and more Americans are choosing the alternative route that was once considered experimental. This ancient form of medicine continues to make its way in the mainstream medical community and has become the number one alternative medicine used in American hospital systems. As more Americans have started to look for other treatments outside of Western medicine, acupuncture has proved to be an effective option. 1. Oriental medicine, such as acupuncture, is a health care system that has been used for more than 3,000 years to treat illness and improve quality of life. 2. All Oriental medicine is based on the idea of bringing the body to balance and improving the the body’s natural energy flow, which is called qi. 3. The World Health Organization has listed acupuncture as a useful treatment for more than 40 health conditions. 4. Acupuncture is known to be helpful as a treatment on its own, as well as a complementary treatment. 5. AOM day is comprised of international partnerships with professional associations, research organizations and educational institutions. 6. The most common complementary and alternative medicines according to the NCCIH survey include acupuncture, acupressure, herbal medicine, tai chi and qigong. 7. Activities on AOM Day include press releases, health fairs, open house tours of college clinics and facilities, and working with AOM professionals and alumni to host free treatments and talks. 8. The 49 AOM colleges and programs in the U.S. are all part of The Council of Colleges of Acupuncture and Oriental Medicine, which was established in 1982 for the goal of advancing acupuncture and oriental medicine and promoting education. The first 10 people to respond to this blog post, will be eligible to receive one free Acupuncture treatment on Tuesday October 24th at Carolina Holistic Health LLC. concerns, and before starting a diet, cleanse or exercise routine.